We provide turf / sod rolls for great looking residential lawns, sport fields, golf courses and commercial sodding projects in Maple Ridge, Pitt Meadows, Mission and up to Harrison Hot Springs. Maple Ridge, Silver Valley, Ruskin, Whonnock, Hatzic, Dewdney, Deroche, Lake Errock, Harrison Mills, Harrison Hot Springs and Aggassiz are all places we serve on the north side of the Fraser River. Your sod will be freshly cut from the farm and delivered to your home. Be sure to check out our new lawn maintenance guide for directions on how to take care of your new lawn. Maintenance Guide. We also off new lawn maintenance services and products from our online store. Your sod order will be shipped on pallets. Be sure to lay your new turf as soon as possible, preferably within 24 hours of receipt. During warm weather sod that has been rolled up may start to turn yellow. The sod farm normally harvests the evening before shipping. All you need is your square footage and we will convert your area size to how many rolls of sod you require. Please allow us a day or so to arrange your order for delivery. If you need your sod sooner we can normally find alternative shipping methods or make arrangements for a pick up near your location. Do you have questions or need assistance? Complete the form below, we call you within a few moments. Your local turf farm supplier in Maple Ridge, Pitt Meadows and Mission. Nursery sod rolls sold fresh from the farm. 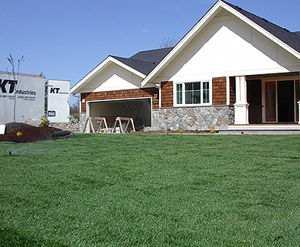 BC Instant Lawns has been a sod and sodding service for the Fraser Valey and Vancouver for over 20 years. Hatzic, Harrison Hot Springs, Agassiz, Deroche, Dewdney, Mission are all areas we serve for supply and delivery of sod / turf grass rolls direct fresh from the farm.